It’s odd to me how the world, including people, companies and governments, grab onto the latest bandwagon or “viral trend” and jump out of their seats to “change things”. An actual small number of people get attention for feeling “offended” and suddenly everything must change… that is until the next viral topic comes along and then that has to change too. I’m no angel but from my life observations this is usually due to the individual, corporation or even country not having guiding principles, morals, or ethics. Basically no “moral compass” to keep on the right track during turmoil or disruption. Based on what we’ve seen in the USA the past decade or two it’s pretty obvious. Corporations driven by greed, governments driven by control, and individuals driven by entitlement. 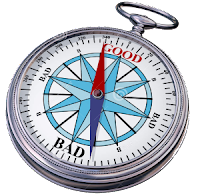 Without that moral guiding compass, people, companies, news media and governments lose their way during the temptations, disruptions, and squeaky wheel situations and jump at the latest “threat” usually over reacting and creating more turmoil in the long run. Nothing actually gets improved and now the rest of the world is offended or unhappy. To me, a “moral compass” doesn’t mean a certain religious, lifestyle, political ideology or other. It means doing the right thing for everyone involved with logic, sustainability, and compassion be it individual, company or government. It means taking care of yourself first but taking care of others in true need. It means not being distracted by the latest viral trend. It means staying the course you planned but being aware of what is short term versus long term concerns. If we would guide our life, companies, governments and world with true quality principles, we can weather the storms and truly assess what should change and what should not change just because it’s the latest “trend”. My two cents… no returns or refunds.